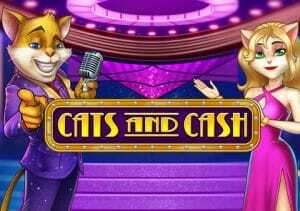 A TV gameshow featuring a cast of cats is the backstory to Cats and Cash, a simple 5 reel, 15 payline video slot from Play ’N Go. Highlights here include a wild that doubles payouts when it forms part of a winning line and a pair of feature rounds. The Wheel Bonus offers awards of up to 5,000 times your bet with the Pick A Gift round paying up to 2,000 times your bet. Play on all devices from between 15p and £75 per spin. There’s a glitzy look to the design here. The reels include a quartet of cat contestants. They’re joined by wads of cash and a diamond necklace. The best paying symbol is the stack of gold bars – land 5 of these on a payline and your reward will be 166.66 times your bet. Pick-a-Gift Bonus feature – this round is triggered by landing 3 of the gift box symbol on a winning line adjacent reels. You’ll be offered a selection of 10 gift boxes. Choose 1 and you’ll win a prize of up to 2,000 times your bet. Wheel of Fortune Bonus feature – landing 3 Bonus symbols in the same payline from left to right triggers the second feature. It’s a classic spin the wheel bonus. Where the pointer lands determines the size of the prize awarded. Get lucky here and you could pocket a 5,000 times bet payout. If you land on a starred orange segment, you’ll win the coin amount shown as well as receiving a respin. The medium variance Cats and Cats certainly won’t be winning any awards for innovation. It’s a solid enough performer though. There’s a classy feel to the design and the pair of bonus features deliver some decent winning opportunities. Get lucky there and these felines could leave you purring – there’s a cool 12,362 times your bet to be won if you get really lucky! If you like cats, I highly recommend you try NetEnt’s Copy Cats or Microgaming’s Exotic Cats.